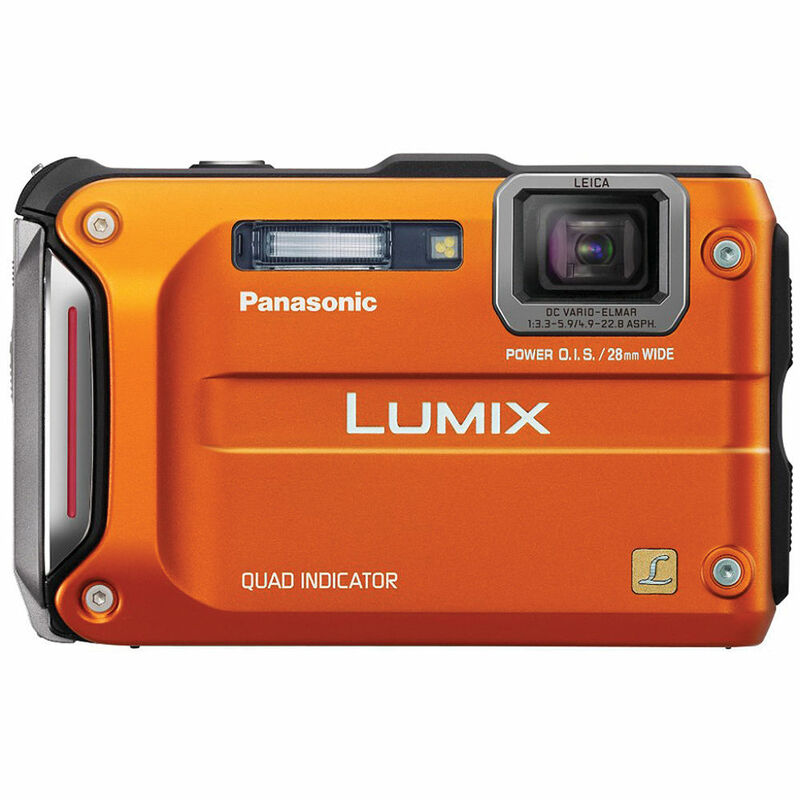 Panasonic's Lumix DMC-TS4 Digital Camera (Orange) will be there for you when other cameras stumble and fall--it's built to survive a drop of 6.6' (2 m), it's waterproof to 39.37' (12 m), dustproof, and freezeproof to 14°F (-10°C)--as close to indestructible as a compact digital camera gets. And the TS4 is your best travel companion: it has built-in GPS that geo-tags your pictures with the Country/Region/Town where they were taken, as well as a compass, an altimeter, a barometer, and a world clock that will automatically set itself to local time! And what makes the TS4 an image-maker par excellence? 12.1MP of resolution, a 4.6x Leica wide-angle 28-128mm (35mm equivalent) lens, full 1920 x 1080 HD video, and a bright 2.7" LCD monitor with 230K-dot resolution. Sonic AF gives you very fast autofocus, and the shutter lag is one of the shortest among compact digital cameras. It has Power O.I.S. image stabilization plus a Motion Deblur function, so you never have to look at another blurry photo, and your videos won't make you queasy. Face Detection and Recognition modes give you great photos of people by optimizing exposure and focus for faces, and Intelligent Resolution ensures great image quality even using high ISO sensitivity (up to 6400). 8 color modes help you tweak pictures creatively and a variety of Scene modes (for photos and movies) maximize every image for you. You can share any picture or movie you shoot by uploading to sites such as Facebook or YouTube, using the included, easy-to-use Lumix Image Uploader. With waterproof performance to a depth of 39.37' (12 m), equivalent to the "IPX8" and "IP6X" standard, the DMC-TS4 supports active shooting on a beach, underwater or in a pool. If the camera gets dirty, soil and dust can be washed off by using water. The DMC-TS4 is shockproof, even when dropped from a height of up to 6.5' (2m). It lets you shoot actively while moving around, even with the camera in one hand. The DMC-TS4 is dustproof equivalent to the "IPX8" and "IP6X" standard. While hiking or playing sports, fine dust particles can enter through gaps in the camera body and cause malfunction. The DMC-TS4 can be used in these activities without problems. Freezeproof to 14°F (-10°C), the DMC-TS4 supports shooting while skiing, snowboarding or skating. The DMC-TS4 is specially designed for active outdoor use. It adopts GPS, compass, altimeter and even barometer to show and record altitude, barometric pressure and orientation data. The barometer also works for indicator for depth underwater. The altitude gains higher accuracy by using GPS data with DMC-TS4. The barometric trend is available which helps users to forecast the climate and the log of altimeter log tells how high he/she was. The LUMIX GPS displays not only latitude and longitude, but also the area information that covers 203 countries or regions and the landmark information of over 1,000,000 locations in 82 countries or regions. The DMC-TS4 shows the name of the Country/Region, State/Prov./County, County/Township, City/Town/Village and Landmark using the internal data to give users real-time information of the place when taking photos. The photos and movies with the location names are automatically sorted in the virtual folder alphabetically in the camera allowing quick reach. These geo-tagged images can be pinpointed on the maps of social media internet maps to be shared with your friends and families. You can even create your own landmarks with the DMC-TS4 for your home, your family or any place you like. (Max. 50 places). Simply select "GPS" and shoot, and then information of latitude and longitude is recorded to EXIF data of the photo / video. Internal clock of the camera is automatically adjusted to the local time of the place where the camera is, so you do not have to set the clock manually whether you go abroad or come back home. Once the start time, the interval and the number of pictures to shoot are set, the camera automatically records images. You can leave the camera and get a record of subjects such as flowers coming into bloom, scudding clouds, or wild animals in nature. The Miniature Effect Mode in which the peripherals are defocused while saturation and contrast are emphasized to give the picture the look of a diorama. The Panorama Shot Mode makes it is possible to shoot a 360-degree horizontal or vertical panoramic image. The Auto Retouch function adjusts contrast and brightness to give a different look to the photo with just a press of a button. Appropriate retouching is automatically applied depending on the image - if the image was shot too dark, it can be made to look clear and bright. The Handheld Night Shot Mode generates a beautiful night scene by multi-layering the images shot consecutively. Bright, glamorous night scenery can be recorded without using a tripod. The 3D Photo Mode produces a 3D image in the camera. The image-processing method used by LUMIX records beautiful images with less distortion or visible image links. The picture size is fixed to 2MP (16:9). Gyrosensors detect hand-shaking and the O.I.S. lens shifts to compensate, helping prevent blurring caused by hand-shaking. The Motion Deblur Mode judges the appropriate shutter speed and suppresses motion blur. This mode sets the highest shutter speed possible in a given situation to avoid blurred images. The Intelligent ISO Control function detects subject movement and automatically adjusts the ISO setting and shutter speed to best suit the movement and light conditions. The Face Recognition function remembers faces that have been registered in the camera and provides the faces with optimal focus and exposure. The Face Detection function detects faces anywhere in the frame and automatically chooses the optimal focus and exposure. The Face Detection also features the Digital Red-eye Correction (Red-eye Removal) in photo recording. Once you focus on your subject, the AF Tracking automatically and continuously tracks it and keeps it in focus and proper exposure. The DMC-TS4 provides easy-to-use manual controls. You can set the aperture to control the depth of field, and adjust the shutter speed to freeze moving subjects or create a motion blur that exaggerates the feeling of movement. Battery Life: The energy-saving Venus Engine and the efficient, rechargeable lithium-ion battery lets you take approx. 310 shots on a single battery charge (CIPA Standard). Also included are Built-In Memory, Guide Line, Copy, Real-Time Histogram, Minimum Shutter Speed, World Time Setting, Focus Range Display, and Travel Date Setting. The DMC-TS4 features a high-quality Leica DC Vario-Elmar 28mm wide-angle lens with a 4.6x optical zoom and focal length of 4.9-22.8mm (35mm camera equivalent: 28-128mm; 30-140mm in 35 mm equiv. in video recording)). The optic boasts aperture of f/3.3 - 5.9, 2-step, or f/10-18. The folded optics of shaft guide method is adopted to secure the toughness of the lens unit. This lens unit comprises 10 elements and a prism unit in 8 groups, including an ED lens and 5 aspherical lenses with 6 aspherical surfaces passing Leica's stringent standards to deliver exceptional optical performance to the edges. In addition to reinforcing the exterior of the camera with shock-resistant material, the DMC-TS4 uses folded optics to prevent its lens unit from taking damage when dropped during operation. The lens unit is protected by a supplementary damper to absorb the force from shock impact. All components including the lens unit are reexamined to endure temperatures as low as 14°F, making the DMC-TS4 freezeproof. The 28mm wide-angle lens lets you easily capture large groups of people indoors or expansive architectural structures and scenes with dynamic width and rich perspective, even from short distances. The Intelligent Zoom is an extensive zoom function using digital zoom, however, you can even draw the subject 2x closer than the original optical zoom with minimum deterioration of image quality thanks to the Intelligent Resolution technology. This means the 4.6x optical can virtually extend to 9.3x equivalent. The POWER O.I.S. (Optical Image Stabilizer) suppresses the low-frequency vibration hand-shake component, which is physically generated when pressing the shutter button or when shooting at night with a slow shutter speed. Active mode is effective for video recording. The 12.1-megapixel CCD with 2-channel signal output structure boasts higher signal transfer speed for the operations that require high performance and speed such as full HD video recording and high speed continuous shooting. The image quality is also improved thanks to greatly increased sensitivity: Fine / Standard (3D Mode: MPO Fine / MPO Standard). The Sonic Speed AF system includes numerous re-engineering enhancements, including a higher-speed actuator, optimized algorithms and parallel software processing. The result is fast and accurate AF performance. In addition, the DMC-TS4 features dramatically speedier focusing that is 28% faster than our previous model. You can quickly focus on moving subjects, such as when you're shooting sports scenes. The DMC-TS4 lets you snap off consecutive shots at approx. 3.7 frames per second in full resolution. You can take a series of shots, then choose the one you like the best and delete the rest. You can also select High-speed Burst Mode or Flash Burst Mode from Scene Mode. The DMC-TS4's Venus Engine processes large amounts of full HD data at high-speed. At the same time, it facilitates a super-fast response time. The excellent S/N ratio of the CCD sensor with Primary Color Filter and the Intelligent Noise Reduction system in the Venus Engine make both photos and videos shot at any sensitivity from low to high display outstanding clarity. Apart from the uniform enhancement of sharpness, the innovative technology Intelligent Resolution precisely performs signal processing pixel by pixel in the most effective way according to the area. As a result, images are naturally clear and crisp. The DMC-TS4 is an advanced photographic tool for recording not only great photos but also beautiful full HD 1,920 x 1,080 and 1,280 x 720 videos in AVCHD (MPEG-4 / H.264) format / MP4 format. The AVCHD format excels in compatibility with AV equipment like HDTVs or Blu-ray Disc players. The MP4 format has higher compatibility with computers. A special, dedicated button lets you instantly start recording videos while shooting photos without having to make any extra settings. For a more effective countermeasure against blur, the Active Mode is equipped with the DMC-TS4 for an option of image stabilization in video recording. This mode is especially effective in active video recording such as shooting while walking. The DMC-TS4 features an LED light that records beautiful videos even in dusky underwater environments or at a nighttime camp. A convenient auto function also automatically turns on the LED when the ambient light becomes dim. The DMC-TS4 lets you use a 4.6x zoom for videos. It takes you right up close to images like animals and sports scenes. iA (Intelligent Auto) Mode/Scene Mode: The camera makes the optimal settings automatically. Still Image Recording: It is possible to take still image while recording video simultaneously. The picture size is fixed to 3.5-megapixel (16:9). Cut Animation: You can cut out a clear still image from a video in the camera thanks to the Intelligent Resolution technology. Video Divide: You can divide a single video into two parts using only the camera. Photos or videos recorded in AVCHD on SD/SDHC/SDXC Memory Cards are easy to view on a Panasonic VIERA TV. Simply insert the card into the VIERA Image Viewer (SD/SDHC/SDXC Memory Card slot) on VIERA TV or Blu-ray Disc players to playback your contents. With the DMC-TS4, you can use an optional HDMI micro cable to output images you took from the camera directly to the TV for VIERA Link. The pictures taken with the 3D Photo Mode via the 3D Image Viewer offers you a whole new exciting experience. The DMC-TS4 gives you a new form of communication by letting you share your photos and movies. All you have to do is checkmark the photos and movies you want to share and connect the camera or SD/SDHC/SDXC Memory Card to a computer. Uploading automatically starts by following the simple instructions. Facebook can be used for photos and YouTube for movies. You can join these social networking services without having to install any special software. It's easy to share photos and movies on the spot, which means that your friends don't have to wait for you to come back home to see them. The PHOTOfunSTUDIO 8.1 Advanced Edition makes it possible to sort and organize photos and videos not only of those newly taken but also of those stored in your computer with quick start-up and fast read-in of images. Recorded videos can be edited with the Short Movie Story function and written into MPEG2 to burn onto a DVD disc. You can also enjoy making photos and videos slideshows with a variety of effects and use your iTunes music library as background music. It is also possible to put a title or add comments on the scene utilizing the information from the people's names registered in Face Recognition. Normal Playback, Slideshow With Music, Filtering Playback (Picture Only, Video Only, 3D, GPS Area, Altimeter Log, Travel, Category, Favorites), Set Favorites, Show Histogram, Resize / Cropping (Trimming), Category Playback, Calendar Playback, DPOF Print Setting, Copy/Title Edit/Text Stamp, 12/30 Thumbnails Display, Zoomed Playback, Set Protection, PictBridge Compatible (Single / Multi / All / Favorites / DPOF), Calendar Display, Optical Zoom in Motion Picture. In addition to 4:3, 3:2, and 16:9, you can now shoot with a 1:1 aspect ratio. This unique square frame adds to your image expression possibilities. The 16:9 ratio produces images that match the aspect ratio of an HDTV screen. Being able to match the aspect ratio to your subject and shooting intent gives you even greater control. Take photos even when you don't have an SD/SDHC/SDXC Memory Card on hand. The built-in memory holds up to approx. 20MB of image data, which you can later copy to an SD/SDHC/SDXC Memory Card or computer. You can also copy images from a memory card or computer to the built-in memory, and view them on the LCD anytime you like. In addition to providing extra memory when your memory card fills up, this is a great place to store your favorite photos so you can view them anytime you want. 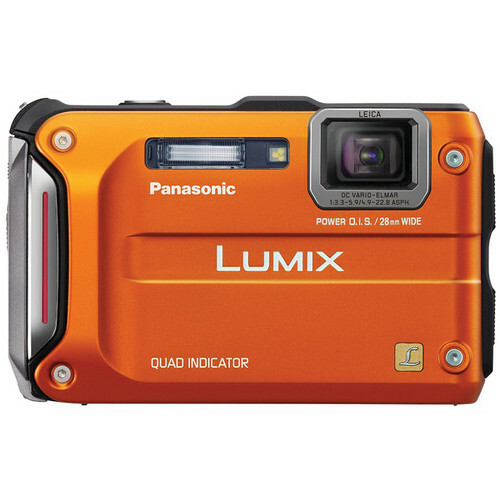 Box Dimensions (LxWxH) 6.5 x 5.5 x 2.0"
Lumix DMC-TS4 Digital Camera (Orange) is rated 4.2 out of 5 by 100. Rated 1 out of 5 by samsadventure from NOT FOR UNDERWATER USE! I bought the Lumix TS2 a little over a year ago, and had been pretty satisfied until I recently took it snokeling(never more than 8-10ft deep) It failed within the first couple of hours, getting water into the insides. I had carefully followed the detailed instructions about sealing & locking the two doors before immersion. They will not cover it under warranty, and want $180 to repair it! Next time, I'll buy a real underwater camera. Rated 4 out of 5 by Joe from Delivers the goods if you're going to be active in the outdoors, this is a great camera and I'm happy to own it. If you're just walking around town, there may be other point & shoots with likely better image quality (IQ). However I have destroyed other non-rugged p&s due to moisture & mechanical shock I experience while skiing or cycling (road and MTB). For me this is a great camera. I didn't give it 5 stars because the image quality could be improved, relative to my other Panisonic p&s, but Im not a camera product engineer so i don't know if this is as good as it can be with this camera's design. Rated 1 out of 5 by sea rain from Panasonic design flaw Design flaw in the cemera itself. Vertical lines and glare will display on the lcd when taking photo of bright objects or when taking photo at the outside pool in sunny condition (video function records these line as well). The record botton gets stuck in the housing. After waited over a month and relentless calls before receiving shipping label from Panasonic. The replacement unit arrived 3wk later (7wks total from the date the issues were initiated and still unresoved). The replacement unit came with a Different color than the color that I purchased and also inherited the same design flaw. I've been pushing between the customer dept and the repair dept in trying to get this these problems fixed. The experience has been rather frustrating. This will be my last Panasonic product and thats a guarantee. Panasonic customer service is way below standard. Panasonic will not provide shipping label. It will be at your expense...unbelievable! Rated 4 out of 5 by Michael from Nice Underwater Camera We purchased this camera to use on our recent trip to Disney. I knew we would be using it to take pics of our kids in the pool, as well as at discovery cove when we swam with the dolphins & the rays. It was simple to use, and the underwater pics came out very well. This is a nice, small camera to take when being used near/in water. It will not replace my DSLR or be used as a primary camera. However, anytime we will be near water it fills a great need as we can still capture our kids having fun w/o having to worry about ruining our DSLR. The battery life seemed short compared to my DSLR, so I recommend you purchase a spare battery or two as I did so you do not miss out on any action waiting for a re-charge. Rated 4 out of 5 by Matt from Just what I was looking for Great little camera. Purchased as an outdoor activity camera and it's great for that. I purchased it partially because of it's good reviews and the fact that it is a ruggedized camera. Picture quality is fine (would be nice to have RAW but it is a point and shoot) and the GPS feature is fantastic. I always like to know my location (and time) and with the GPS tag my photo software plants me within a few feet of where the image was taken. I also love the time-lapse feature and use it frequently. The panorama mode is not good for detail, in fact it's downright pathetic. Standard image stitching in proper image editing programs is better. Battery life will be a fraction of normal if you're using the GPS feature all the time--buy a second (or third) battery. Rated 5 out of 5 by scoutguy from Great all round camera Great all around camera. I was very happy with the underwater quality of the pictures, esp. for the price. I was also happy with the standard landscape pictures, even coming from a very small lens. I used the camera while snorkeling in Kona. If you follow the directions for underwater use you should not have any problems. The battery life is amazing. I am very happy with the camera. Rated 1 out of 5 by NYC Photo Guy from Not Actually a Waterproof Camera When the camera leaks water and you send it back to Panasonic, they will come up with a reason that it is not covered by warranty and either try to charge you for a repair or refuse to repair the camera. This has happened to myself and a lot of other people. Just do a search on the internet. Panasonic is an evil company and their support is downright hostile toward consumers. Go with a Canon, GoPro, or some other brand. Rated 5 out of 5 by A-Dubs from Good travel camera I can't speak to its waterproof abilities when submerged, which seems to be the biggest complaint. I took it for a month-long Asia trip and for my needs it did great. Did great in the rain, and knowing that it was shockproof provided ease of mine especially when taking photos while biking or rock climbing. I can't say that I actually dropped it hard though so I can't speak to that either. Photo and video quality seem pretty good, but I only take photos as a hobby and can't say I have the same eye as everyone else. Given my experience so far, I'll give it 5 stars. A warning though - I haven't had it go through the ringer yet.